Borderlinx | Buy Toshiba and ship worldwide with Borderlinx. Cheap rates guaranteed. Need new tech gear like laptops, tablets, TVs, or cameras? There are few better places to look than Toshiba USA. Products from Toshiba USA vary from gaming PCs, to professional tablet computers, to HD TVs and much more. Whether you're a student or a professional, there is something for you amidst the large selection of Toshiba USA electronics. As one of the largest tech companies in the United States, users have developed a trust for Toshiba and its products, no matter the project or the gadget. Explore how Toshiba USA products can ramp up your productivity and performance today! Toshiba USA is the perfect go-to for your home technology needs, but it doesn't have to stop there! The company also manufactures products for businesses and industry, all at competitive prices. Offering everything a recreational or professional individual would need to complete their home office or living room, Toshiba USA also provides telecom services, motors, power systems, and even medical imaging devices for industry professionals and facilities. In order to give back to the global community, the company also strives to be a global leader in eco-friendly electronics manufacturing, and spearheads several Toshiba USA education initiatives in math and science for students. 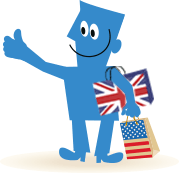 International customers can now buy Toshiba in the USA with Borderlinx! Our Shipping cost calculator estimates cheap shipping, tax & duties upfront, and Borderlinx will ship your order to your home! Borderlinx also offers services including concierge, free repacking, and consolidation to make international ordering from Toshiba USA hassle-free.